After the accident, as you saw in the previous photo set, there was extensive damage to the port-side taffrail. I found House of Stainless on-line with no previous information about them. I emailed a set of photos of the damage and received a quick response with an estimate, a very reasonable estimate. 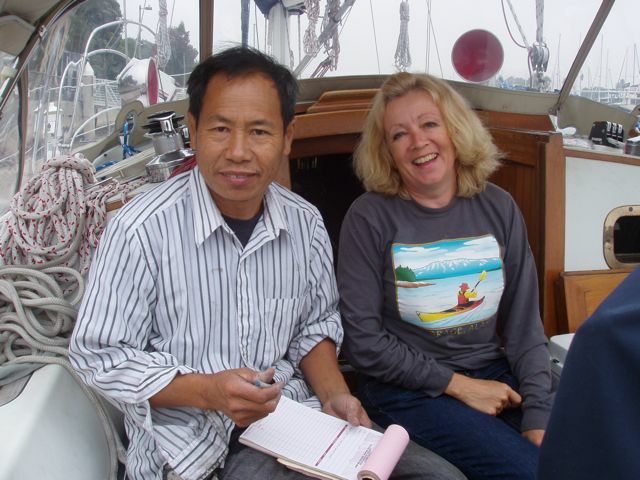 We made arrangements to have their worker meet us as soon as we had a slip in Marina del Rey and that's what we did. He arrived at 9 AM on Monday morning and completed the installation of the finished work at noon on Wednesday. Amazing! It was a treat to be able to watch a modern craftsman create, from scratch, a complex piece like this. 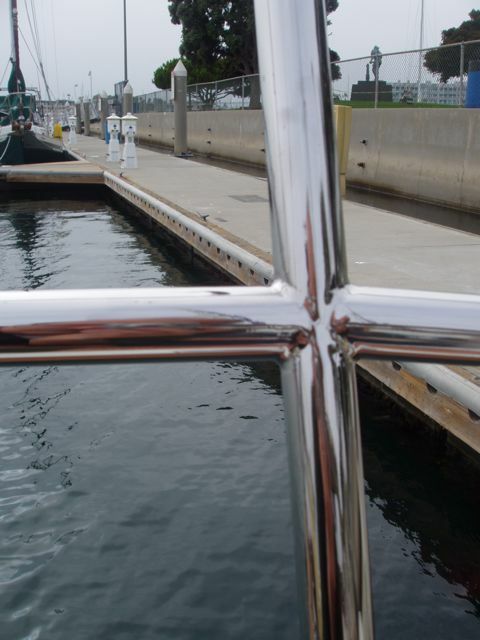 Need stainless work? House of Stainless ROCKS! 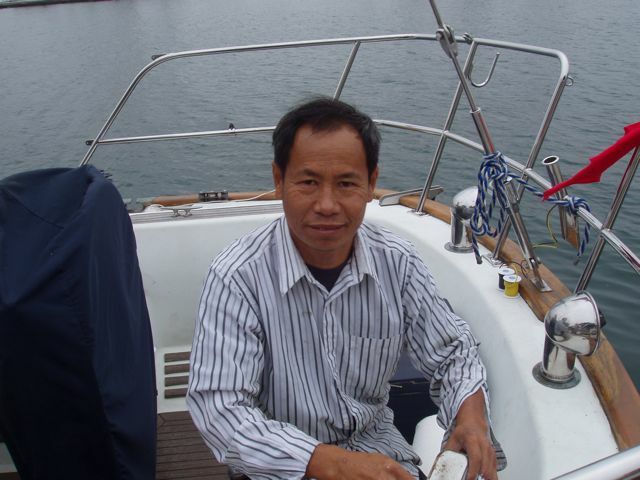 Our friend and master stainless craftsman, Tea. Words are faint praise for this man's talent. Check his work, instead. Tea basks in his efforts as he cleans the excess caulking off the taffrail base. Tea and Conni enjoy his work. One of the new hooks that replaced the old brackets for those old-time liferings. Strong and attractive, they are more what we need. 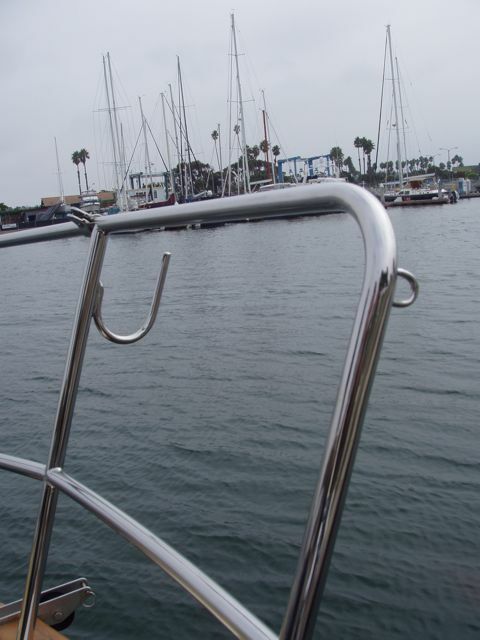 The short tube at center is designed to hold the base of a "man overboard pole": if someone goes overboard, this pole is thrown overboard to mark the spot. 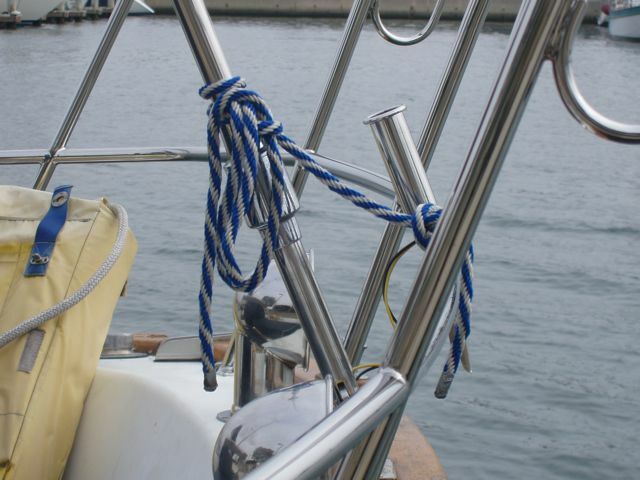 Now the holder and the backstay are parallel because Tea simply cut the old welds on the holder, rotated it to this position, and re-welded it. My favorite part of his work. This is the old stern entry. There are curves in each top tube, but the port tube (on the right, here) was damaged and needed replacement. 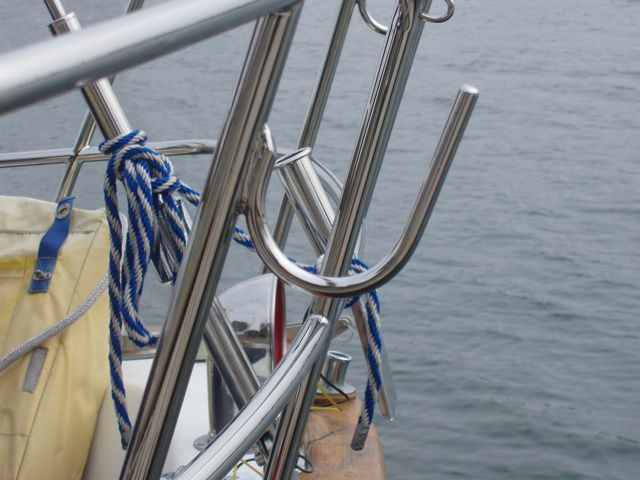 Tea could not match the curves in the new and old pieces, so he simply removed the corner in the starboard (at left) rail, fashioned a new one with a curve that he could reproduce, and now they both match. SO clever! His work looks better than the original, doesn't it? 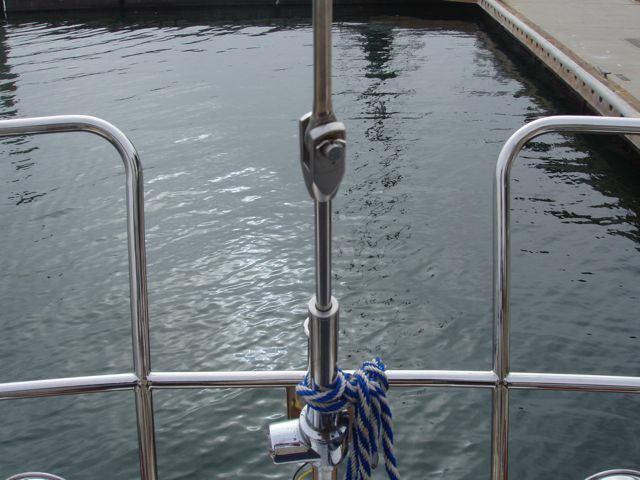 The new port rail end showing the beautiful curve and the re-use of the lifeline attachments from the damaged original. This is an example of Tea's work. Three tubes converge as a vertical tube is connected to two separate horizontal pieces. 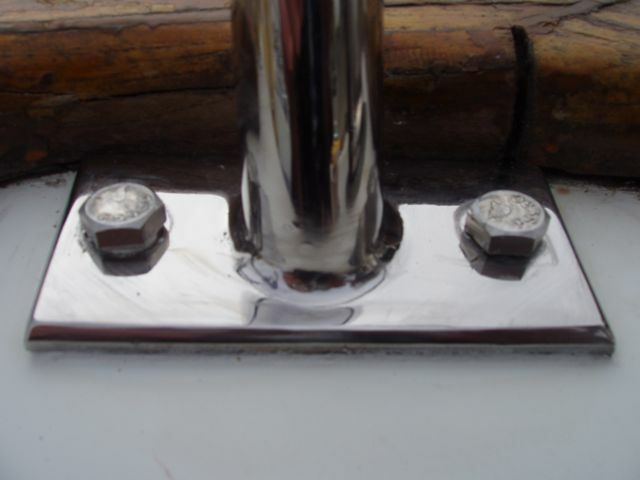 Look at the seamless welds and beautiful matching of heights of the two horizontal pieces. This is a close-up of the tube bases that Tea re-used from the damaged piece. This photo shows the beveled edges of the base plate that would have made this a difficult piece to fabricate, requiring expensive and time-consuming machining. Also note the beautiful seam of the new tube and old plate. This is nice work. 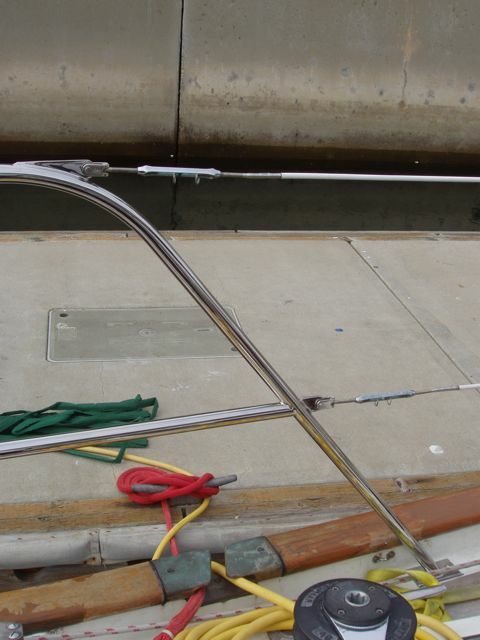 The new gear storage hook and new lifeline eye, both attached to the old starboard side: new work on old tube. Can you tell? 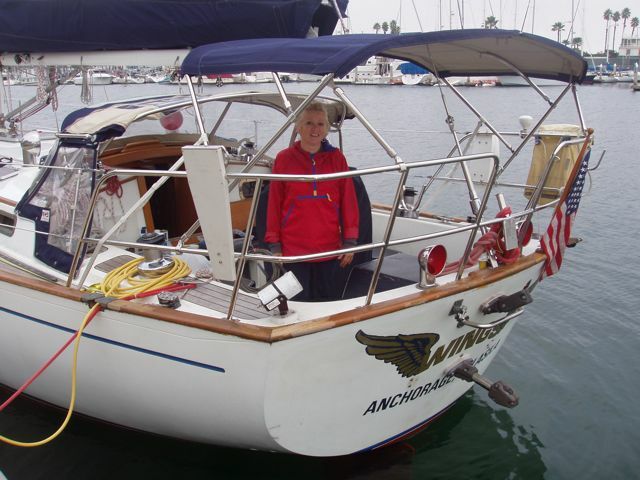 Conni showing the re-assembled cockpit. We both think that it's better than new. 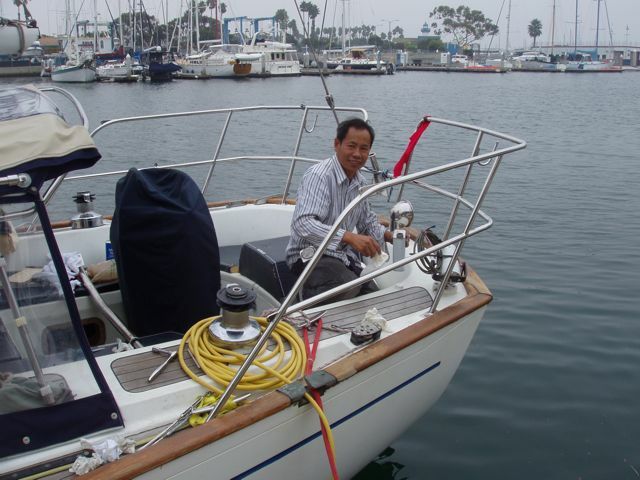 Our new Hydrovane is waiting on us in San Diego and will be attached to the two brackets on the transom.